Some days you wake up, it’s cold outside, it’s raining and you really have to look for a good reason to get up. I, for my part, had a very good one today: a date with Daniel Ramey, president of the Paris committee of the French Hiking Federation, and he is, believe me, a Paris encyclopaedia on two legs. 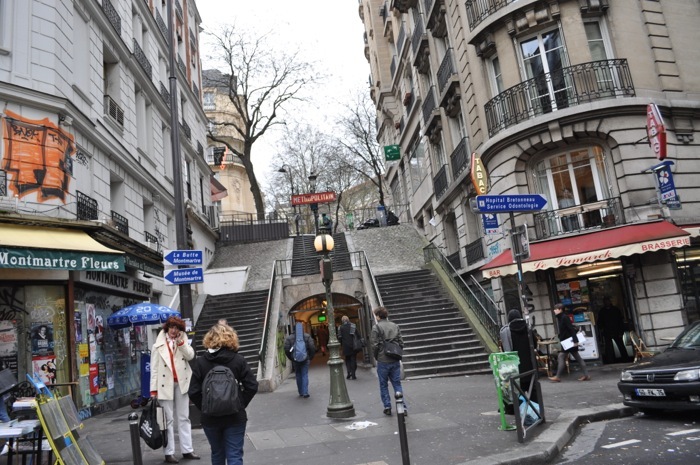 We had fixed a meeting point in front of the city hall of the 18th arrondissement, in other words: in the middle of Montmartre. 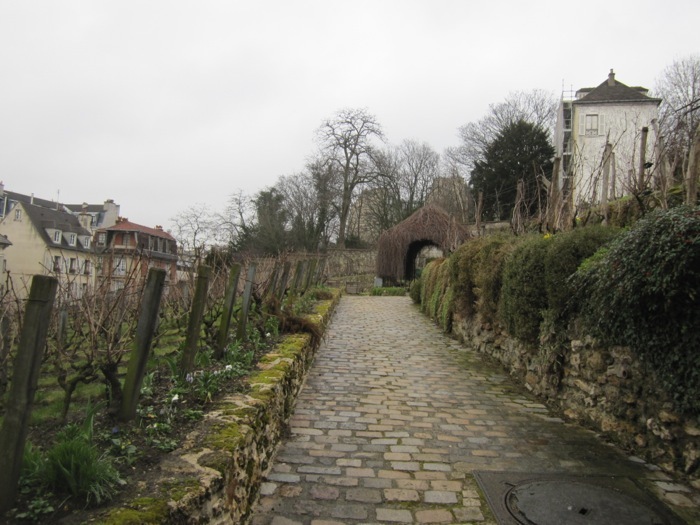 The plan was to discover the secrets of the squares, parks, gardens and even vineyards of what they call here la butte, the hill of Montmartre. 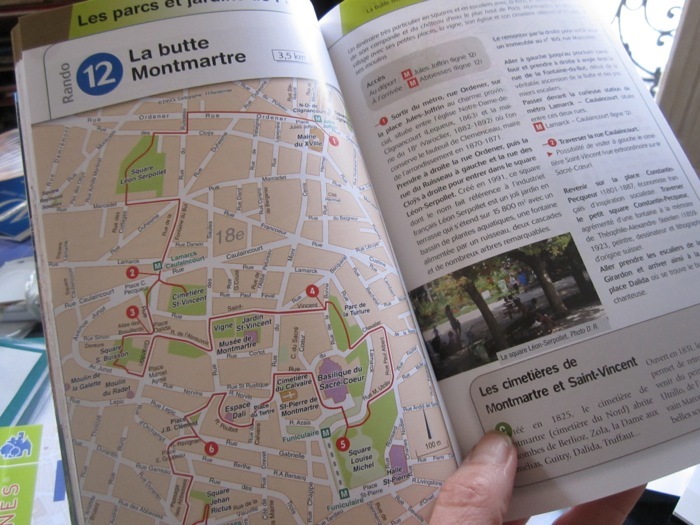 The French Hiking Federation just has published a new guidebook listing 29 hiking trails throughout Paris. Hiking in Paris, you might wonder? That sounds like a nice contradiction. But not at all: Paris has something like 500 parks, only half of them are part of the new guide. If you would decide to do one park a day, you needed nearly two years to do them all. 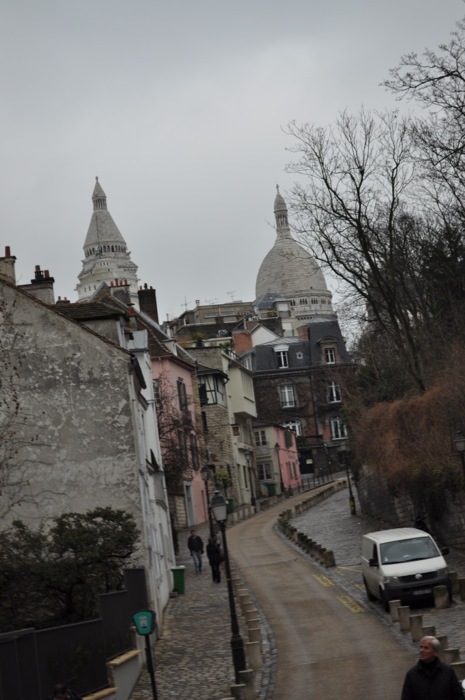 The nice thing with this Montmartre trail is: you will discover this Parisian village against the flow. 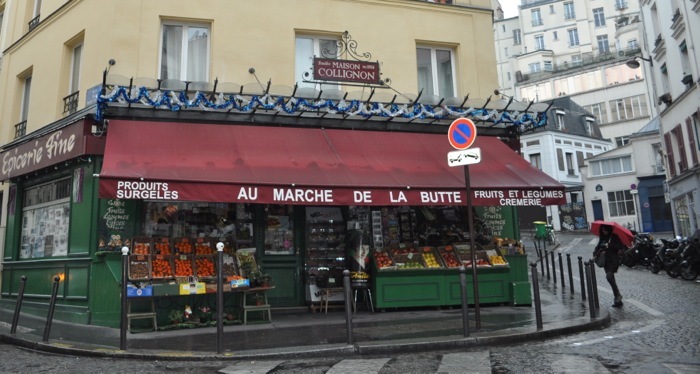 Whereas all the tourists will come from the south, you’ll arrive from the northern side; whereas the masses will stop in front of the famous Basilica of Sacré Coeur and at the most venture forth onto Place du Tertre, you’ll discover the real Montmartre: Rue du Poteau with its grocers, cheese shops, fishmongers, you name it, and the lovely little Place Charles Bernard where they play music on Sunday mornings. You will discover hidden cemeteries like Cimetière Saint-Vincent where Berlioz, Zola, Dalida, Truffaut are buried with astonishing views on Paris or the basilica. You’ll take a lot of steps up- and a lot of steps downhill, you’ll come across the grocery of Amélie Poulain, the famous “maison rose”, you’ll touch the breast of famous singer Dalida (or at least the one of her bronze), run into a Saint, St. Denis to be precise, who’s carrying his head in his hands. According to the legend, after his execution, he washed his head in a fountain exactly at this place before he continued his way, pretty much headless, to Saint-Denis. That’s where they erected the famous cathedral of Saint-Denis which became the burial place of the French kings. But Daniel Ramey is not the kind of guy who would bore you with historic details. “People are not interested in history, they want stories”, notes Daniel. And stories he has aplenty. Wherever he puts his feet, he’s got an anecdote to tell you and to entertain his fans. And he’s got even more fans than anecdotes. Every third Thursday of the month, Daniel Ramey organises La Panamée, a nocturnal walk through Paris with a lot of participants. And when I say a lot, I mean it. “We’re about 240 if it’s raining or snowing”, says Daniel, “and easily 400 to 500 on normal walks, but for special occasions we’ve even been 800.” It’s not a hiking tour, If you ask me, it’s a migration of peoples. Lucky me that I got Daniel Ramey all to myself, or nearly. Our walk, by the way, ended at Le Coquelicot, a lovely bakery with attached café where you can have breakfast all day long. In summertime they even have a sunny terrace where you can sit down after a tiring walk: sometimes you don’t need a lot to feel happy. Remember the grocerie of sweet Amélie Poulain? Here it is!